My husband and I took a day trip to look at some elevators in June, letting the kids off the hook and sparing ourselves their groans and complaints as we toured the countryside. Daykin was one of our stops. 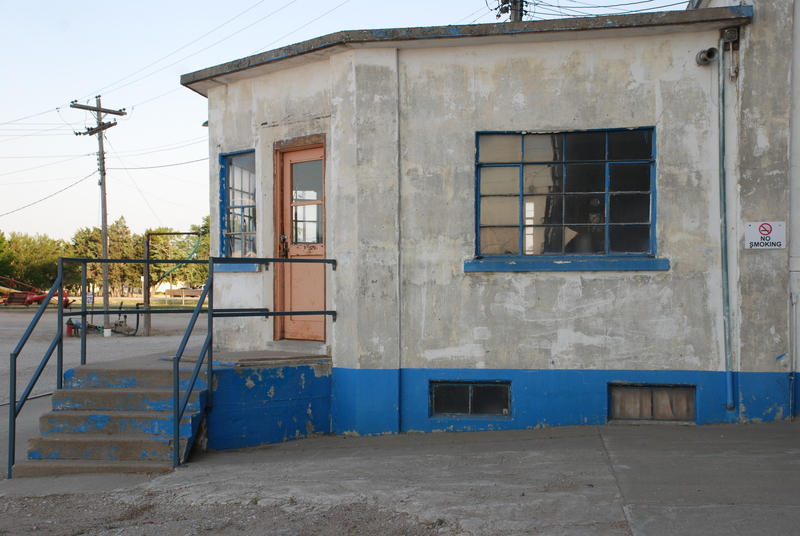 This J. H. Tillotson, Contractor elevator was built in 1947, according to my grandfather, William Osborn. 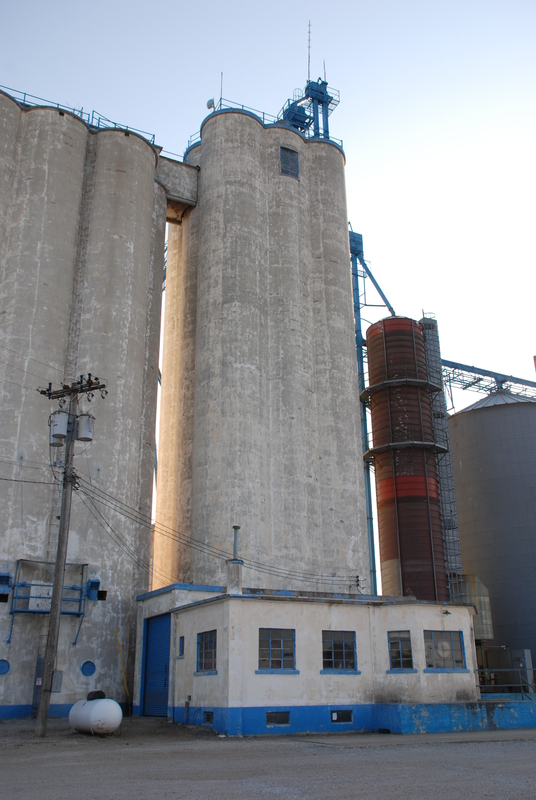 He listed it among his previous projects when he was interviewed during construction of the McCook, Neb. elevator. As I went over the photographs for this post, I noticed, with excitement, that the photo matches one of grandpa’s unidentified photographs in every detail: The concrete driveway has the same inset from the corners, and the windows of the scale house match perfectly. A mystery has been solved. No one was about when we stopped to see the elevator, just before sunset. There was something beautiful about the scale house with its big, multi-paned windows, its blue trim, and its corner detail, with the elevator rising precipitously behind it. I have admired all of Grandpa’s projects for their spare good looks. I wonder how he saw these buildings. It must have given him great satisfaction as he looked upon a completed project–or was it mainly relief? I know he loved tropical fish. He must have appreciated beauty for its own sake–at least a little bit. Was he too close to the elevators to see what I see? In certain light and at certain times, a beautifully done elevator takes your breath away. This entry was posted in J.H. 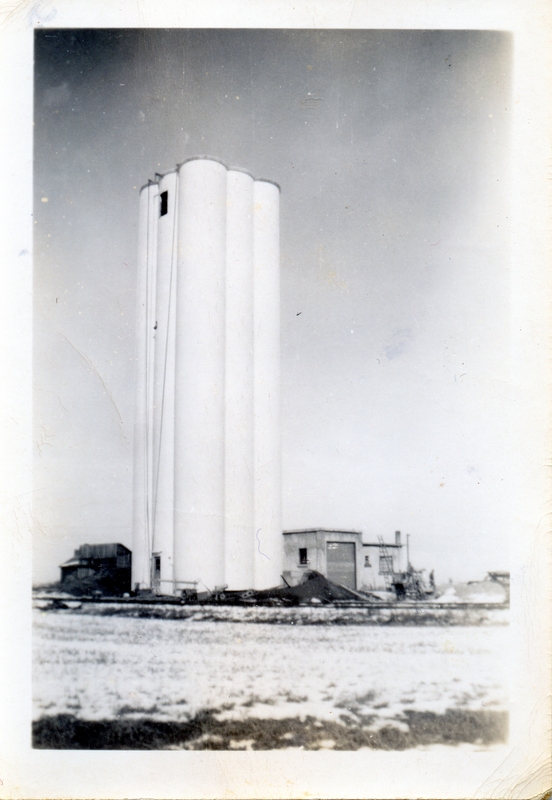 Tillotson, Contractor, Miscellany, William Osborn and tagged architecture, construction, Daykin Nebraska, grain elevator, J.H. Tillotson Contractor, slip-formed concrete, William Osborn. I would be honored if you would use one of my photos. I love your writing and your perspective–I have linked your blog on facebook more than once and people were very positive about your stories. Thank you for your good words! I’ll be sure to let you know when I write the story. And thank you for sharing my work.